The mystery seeds from last week were indeed from figs, as alert readers Heather and Shannon correctly surmised. The seeds are from a dried fruit of the common fig, Ficus carica. Figs are sweet and eaten both fresh and dried. They are used in cooking and baking, such as the fig cookies I mentioned. Figs are nutritious, being high in calcium and fiber. 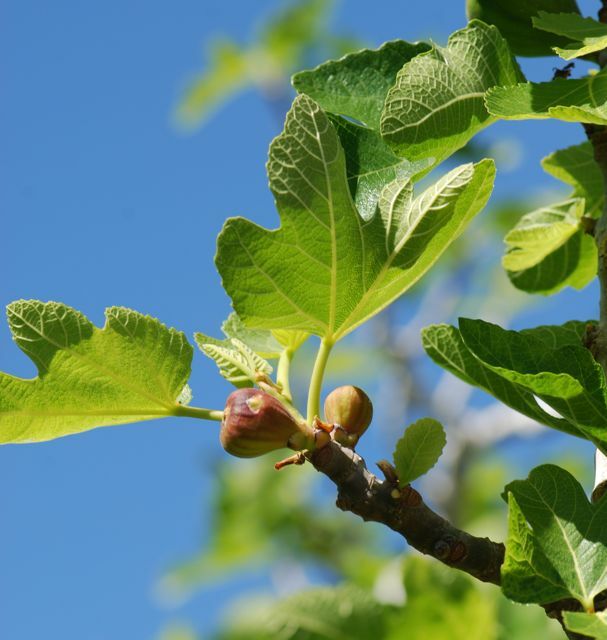 Common fig trees are frost sensitive, so they grow in warmer climates. Figs grow here in Arizona. California is known for its commercial fig production. 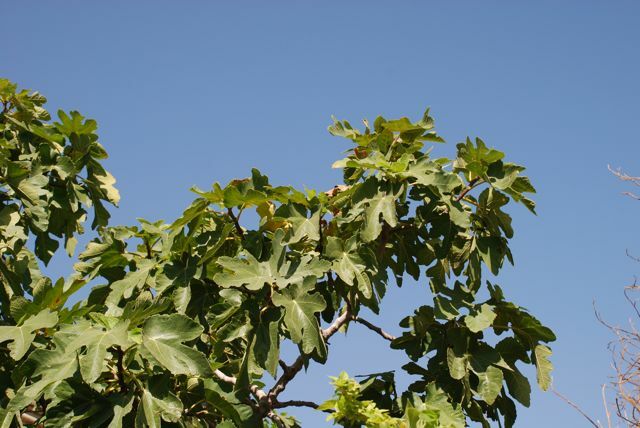 The common fig is easy to recognize because leaves are deeply lobed. 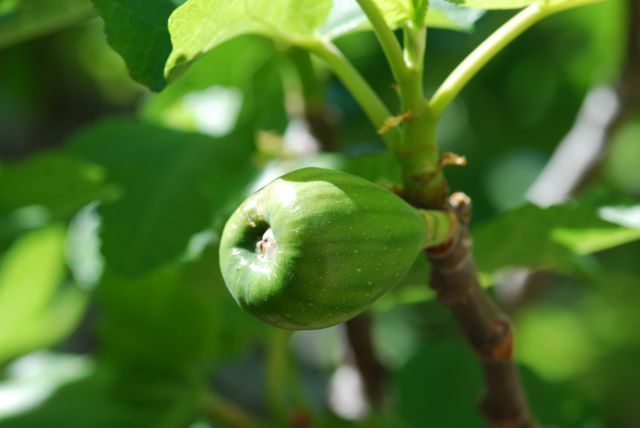 The cultivars of figs that are eaten fresh can self-pollinate, and thus produce fruit without help of pollinators. 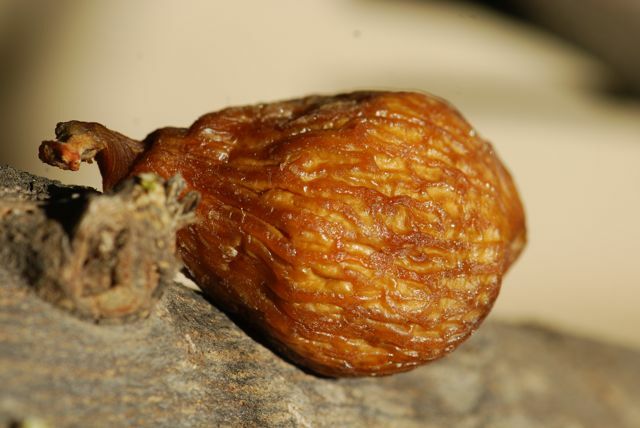 The cultivars of trees used to produce dried figs, however, require tiny wasps for successful pollination and fruit production. 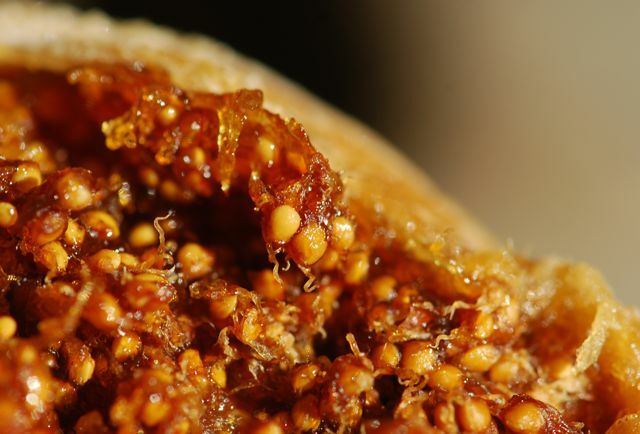 In what is probably one of the most complex forms of pollination in the world, the fig wasps ( Blastophaga psenes) develop within a swollen structure that resembles a fruit, but which actually contains the fig flower. The emerging female wasps pick up pollen (while still inside), crawl out off a hole dug by the male wasps, and then fly on to another fig to pollinate it. This from wasps so tiny and fragile that a slight breeze could blow them away. Cool! 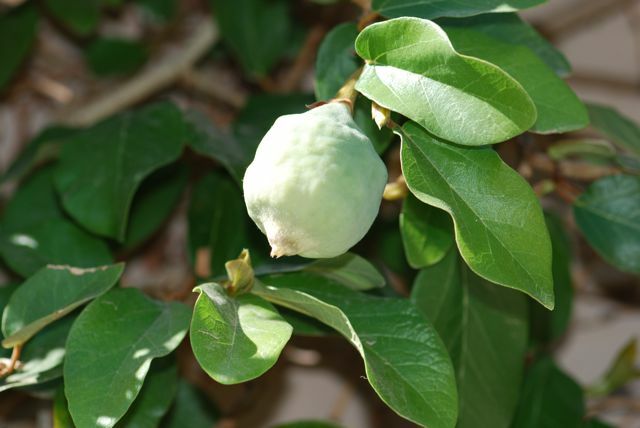 The creeping fig vine from Asia, Ficus pumila, will also grow in Arizona. Recently ours has started to produce these fruit-like structures. The creeping fig is pollinated by another fig wasp, Blastophaga pumilae. I understand it is possible to make a jelly from these figs. The Nature program has a show about a related fig tree from Kenya. It is called the sycamore fig, Ficus sycomorus. It is also pollinated by tiny wasps. Here's the beginning part, which actually captures some of the wasps in action. Figs are definitely interesting plants. Are you using any figs for cooking this holiday season? Do you have any favorite fig recipes? Mystery Seed of the Week fans: Mystery Seed will resume next Tuesday. Wonderful! I have a fig tree in my front yard. I munch on it regularly as I wait for the dogs to do their business, but never knew how it was that it produced those yummy treats. Thanks for teaching me more!